Okinawan Kobudo (Ancient Weapon Arts) is the study of so-called “karate weapons”. This system of Kobudo has been handed down from the late Sensei Shinpo Matayoshi who was considered the highest authority on Okinawan weapons in the world. The Okinawan people developed a system of self-defense using farming and fishing implements. This rare ancient practice has developed into the beautiful art form known as Kobudo. The Okinawa Kobudo system was formed by the work of two remarkable instructors — father and son, who dedicated their lives to leave us the legacy of their style. Matayoshi Shinko Sensei and his son, Matayoshi Shinpo Sensei, through their system, influenced many other Kobudo schools, which are practiced today. The differences between Matayoshi Kobudo and other systems result from a strong Chinese influence which came about from Shinko Matayoshi’s studies. Overall, the movements in the Matayoshi system are more relaxed and flowing, with both linear and circular strikes forming a smooth, fluid style. Matayoshi Shinpo Sensei appointed Gakiya Yoshiaki as head of the system before he passed away in Okinawa on September 7, 1997. Gakiya Yoshiaki Sensei formed the Okinawa Kobudo Doushi Rensei-kai to further this rare, ancient art. This is an organization of people who pursue maturity of one’s personality through learning Okinawan Kobudo. Doushi: People who have the same will, comrades. Rensai: Train your body and soul. The symbol in the center is called “Hidari Mitsu-Domoe (three souls circling clockwise) which is the crest of Ryukyu (Okinawa) royal families, and we decorate nine crowns around the symbol. Our crest expresses the hope that Okinawan Kobudo, the traditional Okinawan martial arts, will expand and develop throughout the world by Kushu-Rengyou and Kugyou-Kyukyoku of our comrades. Kushu-Rengyou: Be skilled in martial arts through many years of training. Kugyou-Kyukyoku: Master the true martial arts through unbearable practice. The Bo is the base weapon of the system. Technically it forms the foundation for most of the other material and it has the most amount of material associated with it. The Bo possibly began as a broken tree branch used to aid in walking and fending off wild animals. And it then evolved into the awesome weapon that we know of today. The Sai is the only weapon of the twelve that was originally an actual weapon. It was a police officer’s weapon and badge of authority. Sai was often utilized in full sets of three, whereas the third was thrown into the assailant’s foot or chest. 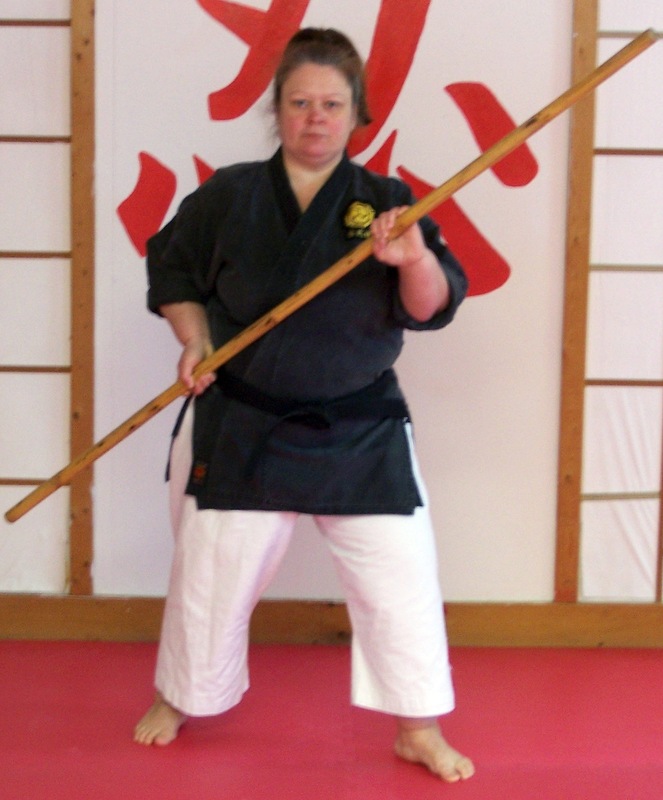 Our Okinawa Kobudo system teaches the safe and proper ways of throwing the Sai. 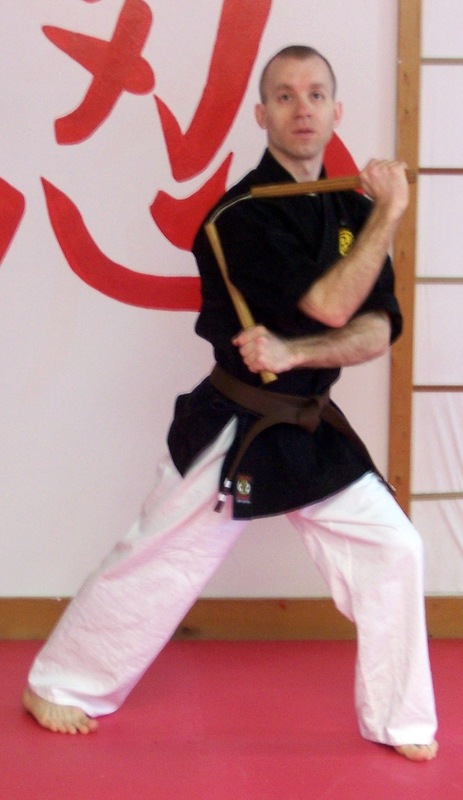 The Tonfa, also known as tunkua or tuifa is another Okinawan weapon traditionally made of red oak, normally wielded in pairs. It’s debated but experts believe they originated in China, possibly as a millstone grinder or another widely accepted theory as a pot holder, (iori) hanging on a wall with the handle of the tonfa (nigiri) being used to hold a pot. There are many theories about the history of the Nunchaku (nuchiku / nanchaka / so-setsu-kon). Some say originally a short Southeast Asian flail used to thresh rice or soybeans (that is, separate the grain from the husk). Unlike Okinawan rice flail (utzu), original nunchaku had curved arms, resembling an Okinawan horse bit (muge), which gave rise to the theory that nunchaku was originally a horse bridle. The kurimanbo or broken bo is yet another popular theory. Over the years this weapon has been made “famous” through various flashy movies and videos. Our Okinawa Kobudo system teaches the full, proper, precise and safe usage of this dynamic weapon.